I've spent the last few nights hunkered down in front of the computer crocheting squares and watching Bleak House. I've made it through episode six and just discovered it's a 15 episode series. Geez, Charles, concision isn't your strong suit, is it? My original plan with the blanket was to do sections 1-7. 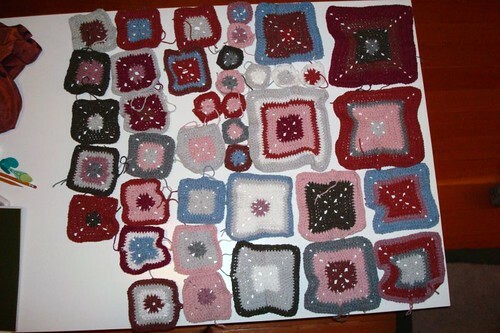 I have four more blocks to make including the two largest blocks. I'll have to assess my yarn quantities when those are completed. So far it nearly covers my coffee table.